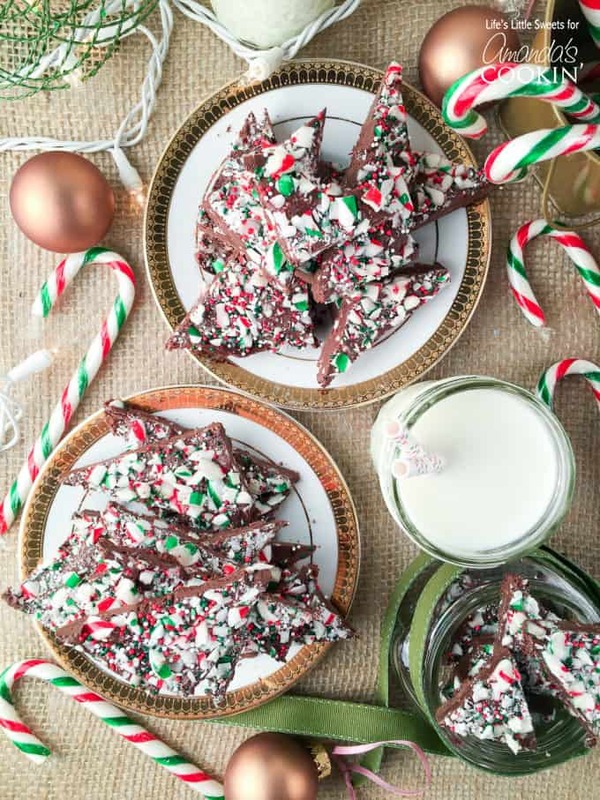 Peppermint Candy Cane Bark: easy chocolate bark with candy canes! 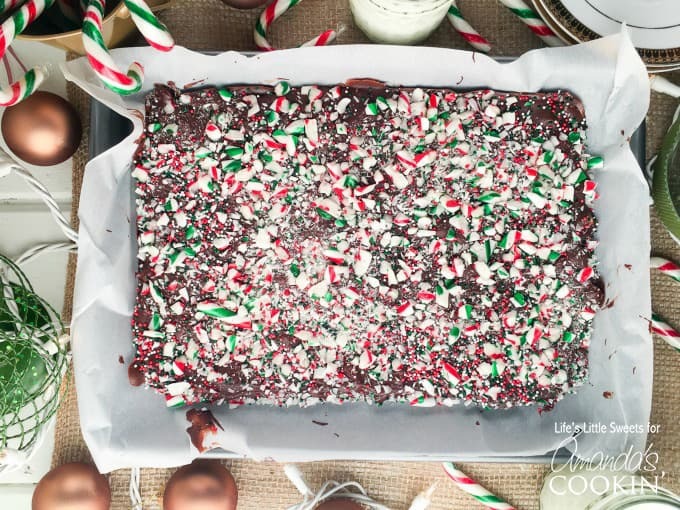 This easy to make Peppermint Candy Cane Bark recipe is a sweet and refreshing candy treat that only takes minutes to prepare. It’s perfect as a holiday stocking stuffer, great to give as a gift in jars and make for yourself as well! 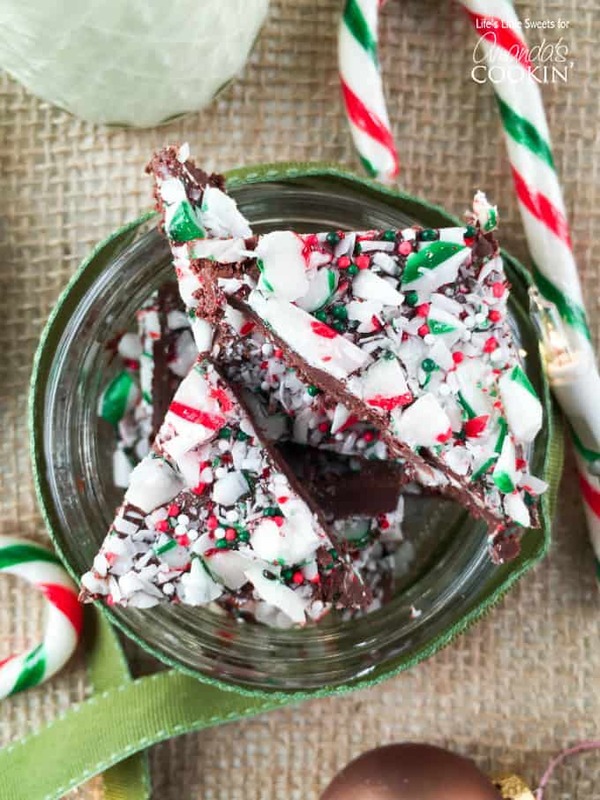 This Peppermint Candy Cane Bark has a crunchy texture to complement the smooth, peppermint-y chocolate. Triangles of these delicious treats taste so good with hot coffee or you can dissolve a little piece in your hot chocolate! It only takes minutes to prepare these lovely, sugary shards making it a perfect, easy, last-minute treat to make. Those bright white, green & red colors pop so well making this Peppermint Candy Cane Bark a simple, yet gorgeous centerpiece on any dessert table. We love this just as much as our Saltine Toffee! 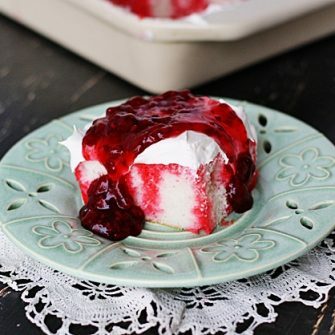 When I was testing this recipe, I shared photos of it on my Snapchat and Instagram and I immediately got relatives asking me to save some for them. I believe that your friends and relatives will be clamoring for a bite when you bring this pretty & festive Peppermint Candy Cane Bark along to your next holiday gathering! 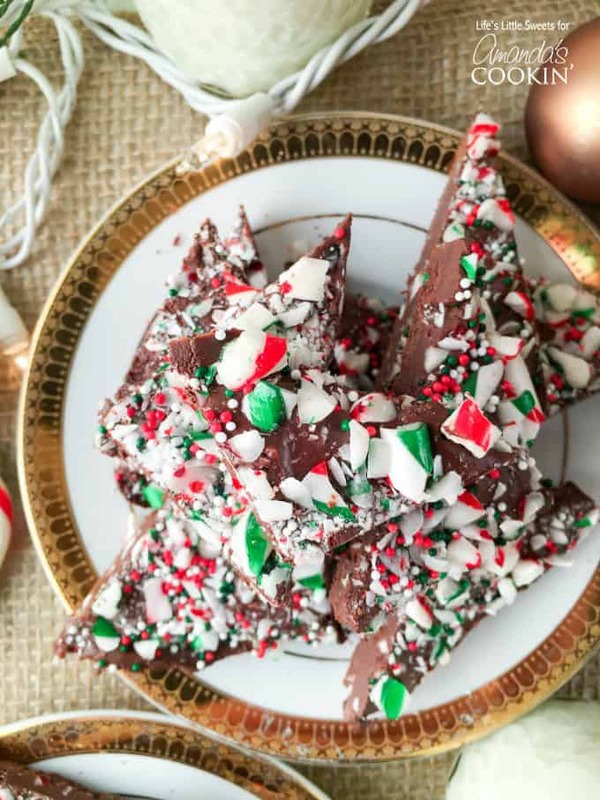 I love chocolate bark recipes because they are so easy to customize for any season. If you are making this post-holiday season, this is a great way to use up all those extra candy canes. 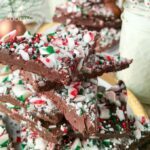 Peppermint Candy Cane Bark only has 4 ingredients, 2 of which are optional, making such an easy, no fuss, no bake recipe to make during the busy holiday season. 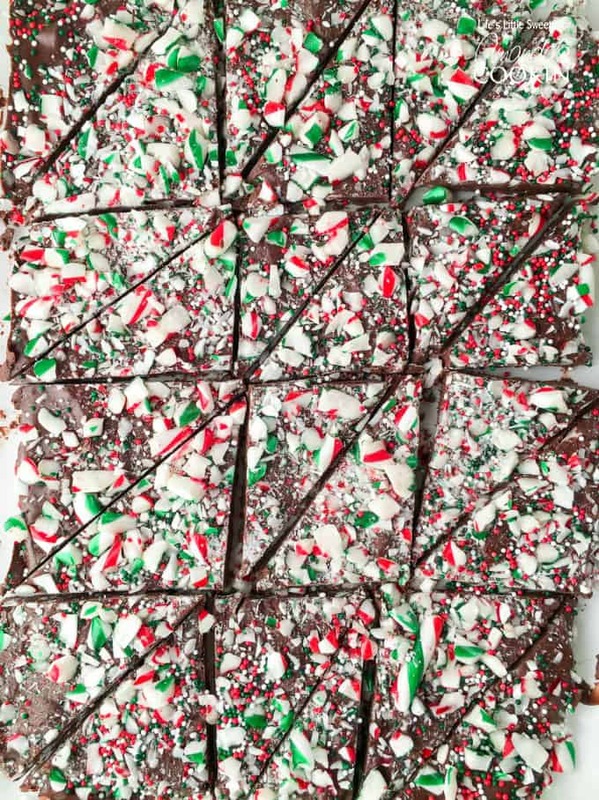 Another one with minimal ingredients are these amazing looking peppermint topped fudge brownies they look so good! With everyone’s busy schedules and extra events and gatherings on the calendar, recipes should be easy like this Peppermint Candy Cane Bark. I hope you enjoy it and have a wonderful holiday season! 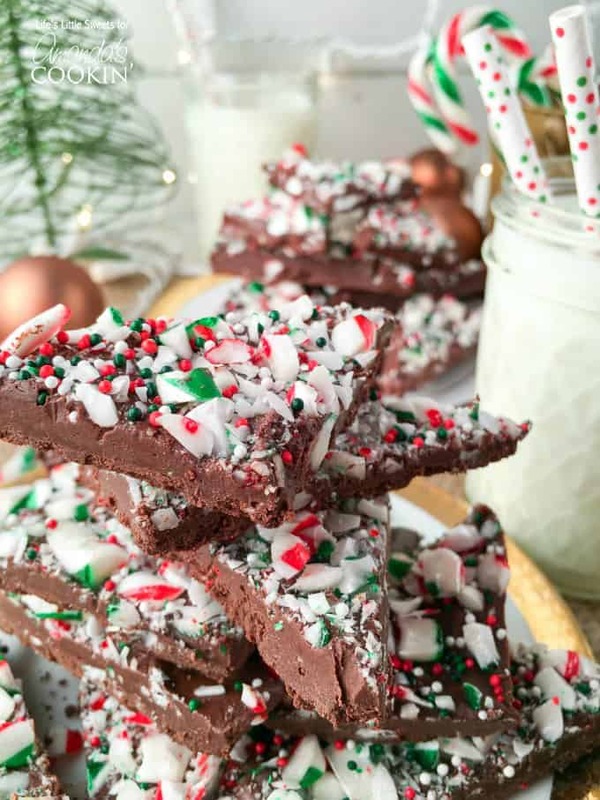 This easy to make Peppermint Candy Cane Bark recipe is a sweet and refreshing treat that only takes minutes to prepare . It's perfect as a holiday stocking stuffer, great to give as a gift in jars and make for yourself too!